The anthurium is a plant genus of around 1,000 species of plants. 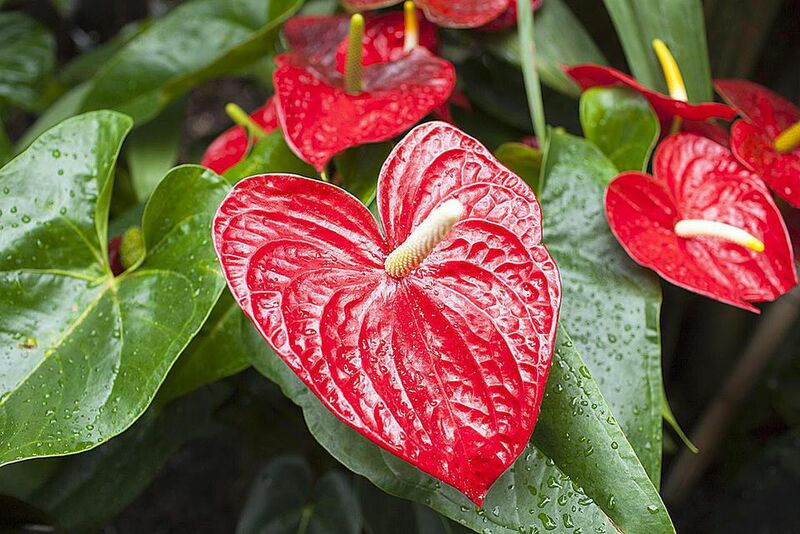 The common names for these plants include anthurium, tailflower, flamingo flower, and laceleaf. These plants develop in bright colors and a wide variety of shapes; some are flowering varieties and some have magnificent foliage. The flowering varieties of these plants are distinctive for their multicolored spathes and red or yellow tail-like flower spikes. Other varieties feature large-leaved, deeply veined foliage. These plants tend to thrive in greenhouses and no type of anthurium is particularly well-suited for most indoor, domestic living without a lot of attention and care. Native to tropical rainforests throughout Central and South America, many anthuriums are climbers and all need high humidity and warmth to thrive. Anthurium plants thrive in bright, indirect light. They do not like exposure to direct sunlight, except in the winter months or in plants that have been carefully acclimated. Anthurium live in temperatures at or above 60 F and the foliage types prefer temperatures even warmer. If temperatures dip below this level, the plant will suffer. Anthurium grow in rich, loose potting soil that should be kept moist at all times, but not drenched. Foliage anthurium may produce aerial roots that appreciate misting and the roots can be gently pushed into the soil from time to time. It is safe and recommended to use liquid fertilizer throughout the growing period or fertilizer pellets in the spring. To best propagate these plants, divide the plant during repotting, or take cuttings from the tip or stem. Older foliage plants have a lot of exposed aerial roots and overgrow their pots. These exposed roots can be cut off at the soil level and potted into new vessels. The roots will grow stems and eventually leaves will emerge. These plants do not need to be repotted that frequently and you can likely repot annually or only as needed. Anthuriums don't suffer from being slightly underpotted and having room to grow. When you do repot anthuriums, use high-quality potting soil. A. andreanum. These feature heart-shaped leaves that grow up to 1 foot, with flowers available in red, white, pink, and variegated colors. They are distinguished by a straight flower spike. A. scherzerianum. The most forgiving of anthuriums, it features a curling orange flower spike and the leaves are arrow-shaped. A. crystallinum. These have deep green, velvety leaves with pronounced white ribs. The leaves grow up to 2 feet across. A. faustinomirandae. A monster-sized plant with cardboard-stiff leaves that grow up to 5 feet long. This is almost exclusively a greenhouse plant. All anthuriums prefer plenty of warmth, regular moisture, and ample fertilizer. The easiest to grow at home are the A. scherzerianum and A. andreanum. These plants have been extensively hybridized and are relatively common in garden centers. Flowering anthuriums will flower any time of the year, provided they are healthy. Foliage anthuriums are mostly found at specialty greenhouses or through online nurseries. To grow them best, approximate conditions found in tropical zones, and if necessary, provide a climbing support for foliage to thrive.